I have officially been off of crutches a little more than a week and I couldn't be happier about it. I had never been on crutches before I broke my foot and I have a whole new appreciation for anyone that has to use them. It is a lot of work, hard on your hands ( I now have callouses on each one), hard on your back, hard on your chest muscles. I also appreciated everyone who helped me out.... for ever single person who held a door or packed something for me. I guess most of all my daughter and husband who helped me do things around the house, packed things for me, drove me around to appointments, for groceries etc, etc, etc. The list goes on like ...13 weeks long. I read a lot, watched t.v and colored a lot of images. It took me a bit to get into making the cards, cause to move around my scrapbook room was a challenge as well as frustrating. So for the first quite a few weeks I just colored at my kitchen table. So I had this image colored long before I was able to create with it and make this card. This digital image as has a bonus file with some great sentiments included. 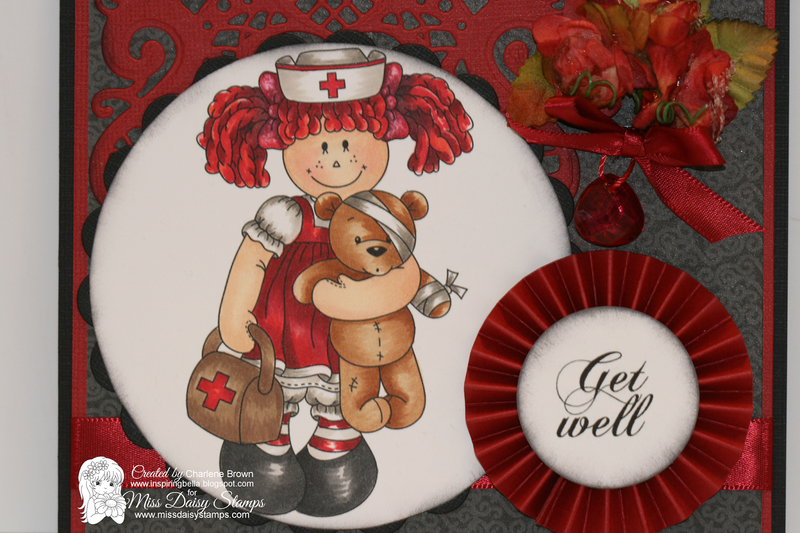 The "Get Well" is one of the sentiments. A closer look at my colored image. I hope you grab a image and create something fun. I must add, Charlene, that your shading and highlighting is absolutely fabulous!